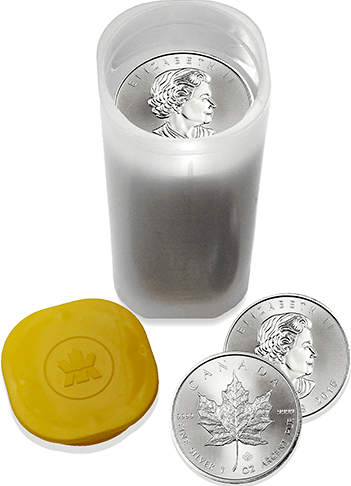 You can buy the 1 ounce Canadian Maple Leaf Silver Coin through us at wholesale quantities, as minimum packs of 25 coins. These coins are bought from Australia's institutional precious metals markets (so AUD only). Due to the current strength of the USD, you have a fantastic Forex opportunity by investing in silver Maple Leafs to either privately vault with us or have delivered to you. The institutional nature of these Australian wholesale markets means that you are able to access some of the lowest premiums and price spreads in the industry because there is no added retail sector margin. You can now directly access these amazing markets through us. The Royal Canadian Mint started producing the 1 ounce Maple Leaf bullion coins in 1988 and from the beginning they were at a fineness of 9999. 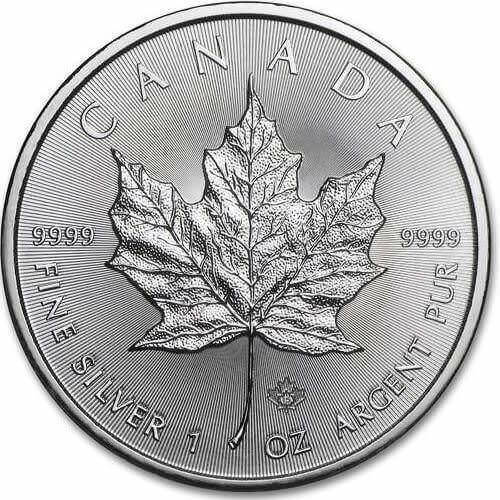 Even today the Maple Leafs are still of a higher purity than its counterparts from other countries making this an excellent silver bullion coin to buy in bulk. This is primary reason responsible for them being amongst the highest in demand silver bullion coins in circulation. 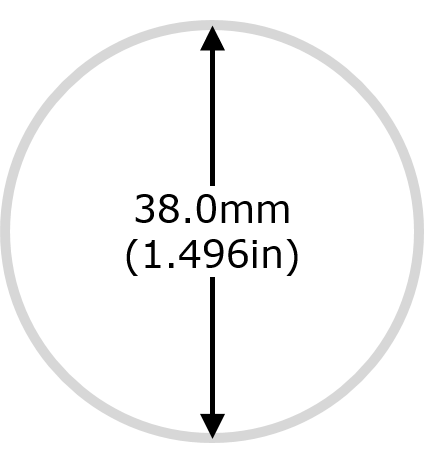 The Canadian Maple Leaf Silver coin is legal tender in Canada, with a face value of CAD $5, which is also the highest face value of its international counterparts. The wholesale physical precious metals marketplaces only allow you to buy these 1 ounce Canadian Maple Leafs in minimum packs of 25 coins. These packs of 25 coins are in the same plastic tube as packaged at the Royal Canadian Mint. Due to the continuous circulation of these wholesale packs, we are not able to offer any guarantees on the year that the coins were minted. And unfortunately we also can't tender to any requests for specific years. All bullion is directly sourced refiners and mints who supply their liquidity into the global Allocated Bullion Exchange network which consists of the largest 7 physical precious metals trading hubs in the world. All physical bullion traded on the ABX Global market are legally binding contracts. For the silver Canadian Maple Leafs, their contract details are tabulated below to help ensure complete transparency for you when placing an order. These contract specs cover all market locations. To see all of our contract specifications for all of our products you can view / download our physical bullion catalogue pdf. We have provided explanations about the various parts of the contact to help you understand their meanings. From 2014 onwards the Canadian Maple Leaf silver coin was produced with a special security engraving following its successful launch with the Canadian gold maple leaf 2013. 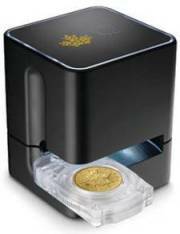 The security feature is basically a digital image of uniquely minted features that is then registered with the mint, known as its Bullion DNA, against which the bullion coins can be checked. 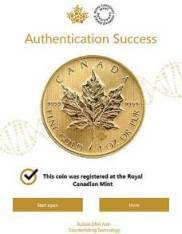 This allows authorised Bullion DNA dealers to verify the authenticity of the silver maples with a level of confidence previously unavailable to the precious metals industry. 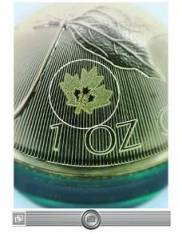 The die used to produce the silver maple leaf coin is micro-etched with a laser to create an anti-counterfeit security mark. The mark is a textured image of a maple leaf with the last two digits of each corresponding year of the coin's issue in the leaf's centre. Both sides of the coin are also etched with very thin radial lines. We have an established and recognised chain of integrity all the way back to the refiners and mints to ensure that your products are true and not tampered with in any way. If ever you buy outside an industry recognised chain of integrity make sure you always verify the coins prior to purchase with a reputable dealer. To access these global physical bullion markets, all you have to do is to create an account with us which takes 2 simple steps to do. 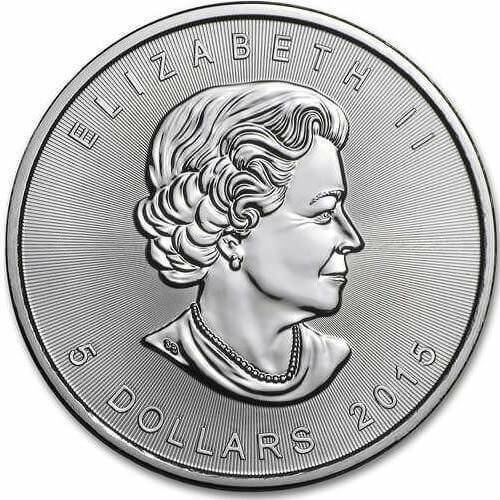 If you have any queries before buying the Canadian Maple Leaf Silver coin, please feel free to contact us.